In the poorest showing since 1984, advertising revenues at newspapers last year fell 7.3% to $23.9 billion, according to figures quietly published Wednesday by the Newspaper Association of America. :: The combined print and digital sales reported by the trade association for last year are less than half of the all-time sales peak of $49.4 billion achieved as recently as 2005.
:: The last time sales were this low was 1984, when they totalled $23.5 billion. Adjusted for inflation, the 1984 sum woud be worth nearly $50 billion today. :: The combined ad sales for all the newspapers in the United States last year were equal to only two-thirds of the sales of a single digital competitor, Google, whose annual revenues were $37.9 billion. ∷ Retail advertising, which is the single most significant remaining business for newspapers, dropped 6.0% for the fourth quarter and 8.0% for the year to close 2011 at $11.9 billion in annual sales. ∷ National advertising dropped 9.4% in the quarter and 10.5% in the 12 months to close the year at $3.8 billion in annual sales. ∷ Despite a strong upturn in vehicle sales in 2011, the automotive classified category plunged 11.9% in the fourth quarter and 10.7% for the 12 months to end the year at $1.1 billion in annual sales. ∷ Reflecting the continued malaise in real estate, this classified category dived 19.4% in the fourth quarter and 19.8% for the 12 months to end the year at $884.8 million in annual sales. :: Though employment advertising improved from mid-recession lows when hiring picked up in 2011, sales in the category fell 3.4% in the fourth quarter and 1.6% for the 12 months to end the year at $743.4 million in annual sales. ∷ Miscellaneous classified slid 10.9% for the last quarter and 10.0% for the 12 months to end the year at $2.3 billion in annual sales. The newspaper industry lagged the performance of all the other traditional media in 2011. Kantar Media, an independent market research firm, reports that television ad sales last year rose 2.4%, magazine sales fell 0.4% and radio sales slipped 0.6%. The only category where sales increased at newspapers in 2011 was digital, where revenues grew 3.1% in the fourth quarter and 6.8% for the 12 months to produce $3.2 billion in annual sales. Though publishers say they are focused on building digital revenues to offset the steady decline that has eroded print advertising since 2005, their digital sales are dwarfed by the competition. In the third quarter alone, online advertising sales advanced 22% to $7.9 billion, according to the Internet Advertising Bureau, an industry trade organization. Full-year Internet statistics have not been published by the IAB for 2011, but this much is known: The $26 billion in sales achieved by the online industry in 2010 surpassed total newspaper advertising revenue 12 months ago. Digital sales at newspapers are even trailing the adolescent Facebook, which sold $3.7 billion in advertising in 2011. Imagine what our friends at the friendly friending company will be able to do after they cash in on their multibillion-dollar IPO. 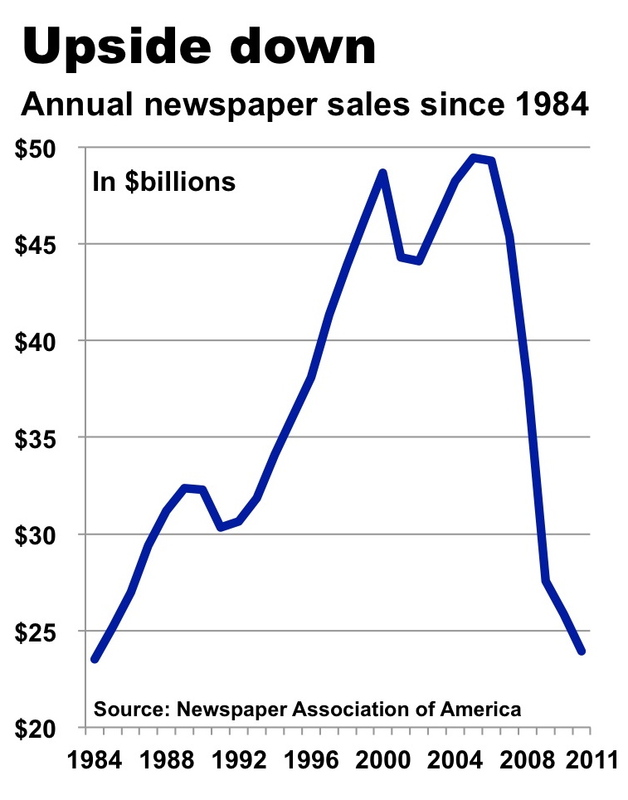 Shouldn't the headline be "Newspaper sales slid to half of 1984 level in 2011"? The comparison seems meaningless when not adjusted for inflation. And that chart adjusted for inflation would look absolutely terrifying. The amazing thing about the newspaper business, even in its decline, is the profit margins. The "evil" oil companies you guys crucify in your pages would kill to have the margins you guys have. I guess that is how the New York Times can give Janet Robinson so many $millions to leave.